From the Hancock County Courthouse go southwest on Hwy 22 toward Devereux for 7.2 miles to Devereux. Turn right (almost backwards on a sharp inverted V) on Main Street in Devereux. Go 0.2 mile to the dead end and turn right onto Glen Ford Rd (Jones Chapel Rd goes to the left). Go 3.6 miles on Glen Ford Rd / Hall Chapel Rd to Watts Road on the left. Turn left and go 1.0 mile. Follow the field road on the right for 0.1 mile to the cemetery in a clump of trees. 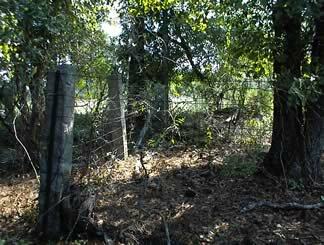 Cemetery has granite posts with fencing marking its boundaries. The cemetery is L-shaped. The bottom of the L is approximately 60' wide and the vertical part of the L is approximately 75' tall. 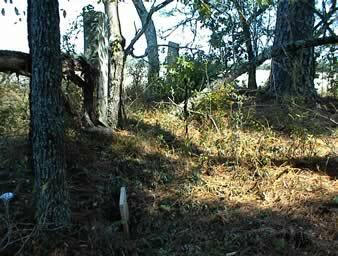 Perhaps 10-20 graves marked by depressions, footstones, or field stones; one with pipe.